Rishikesh is the yoga centre of the world. This small town is nestled in the foothills of the Himalayas, along the side of the religious river Ganges. The town is popular for its ashrams and religious abodes. But over the last few years, it has gained popularity for various other reasons. There is more to Rishikesh than yoga and religious sites. There are people who visit Rishikesh for a pilgrimage trip but there are some who come here for the sole reason of fun. Rishikesh has got a new summer frenzy this year. So if you are planning a summer trip, look no more than this article. Rishikesh is the best option for your summer vacation, with equal bit of leisure and equal bit of adventure. What is better than starting your yoga journey from a place that birthed yoga? Nothing! If you have been dissing the thought of yoga and just happen to visit Rishikesh, there's no way you'll escape the yoga vibe of this Himalayan town. The yoga ashrams even have free classes, so if you can spare a day and just try your hands at yoga, you may end up finding your inner yogi. There have been cases where people have come to Rishikesh on a trip and leave after a month of yoga. Even if you are not a practitioner, you can head to the riverside early in the morning and see other yogis perform their asanas. Another thing that Rishikesh flaunts with utter vigour is rafting. And there is no river rafting experience as thrilling as that in Rishikesh. The rapids are powerful and all you need is a brave heart and thrill to venture on an adventure. It is a fun activity to do with your friends and family. Even if you have never been on a raft before, the humble and comforting rafting guides will help you face your fear. Besides, you will always have a life jacket on so even if you happen to fall in the water, you will survive. Rafting is a thing for all. You can choose to raft on the rapids or opt for quite river paddling, depends on your taste. There are various camps housed on the riverside of the Ganges. The white-sand shores make it more of a beach than a river. Every camp has a perfect place for a volleyball match. These camps provide three-day meals loaded with adventure activities. These campsites are perfect places to spend quality time with your family. They even offer fun bonfires. The entire day could be well-spent with people you love, lazying around or engaging in some fun volleyball game. In all, if you are looking for ways to spend a nice time in Rishikesh, look no further than these camping spots by the river. Rishikesh was first known for its temples, and then yoga, and then rafting. As suggestive as a name can be, Rishikesh is the city of rishis (sages). You'll see many saints walking around in orange clothes and flaunting their dreadlocks. 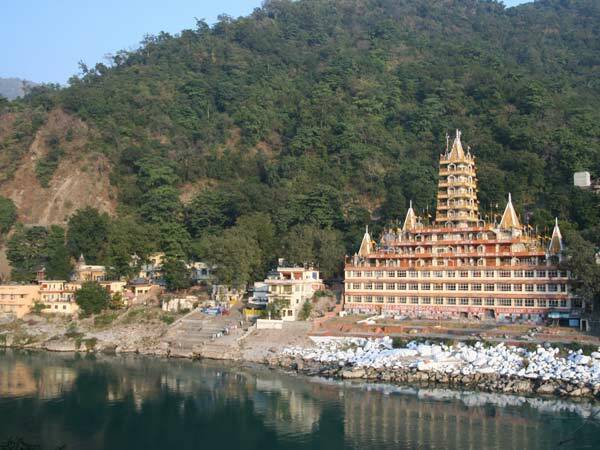 There are many temples to explore in Rishikesh. Some are beautiful and some need an extra effort to climb up. Most of the temples are dedicated to Lord Shiva. You'll find that this small town is in love with Lord Shiva, in every way possible. You'll see statues of Lord Shiva and melodious music dedicated to Shiva. This is one of the most beautiful photograph-worthy events. The aarti is a rather fancy event in Rishikesh. Many tourists visit the ghats just to see the beautiful aarti. It starts with people performing kirtans and bhajans for an hour and then follows the aarti. About 10 young priests, facing the riverside, with huge diva stands in their hands, start the ceremony. It happens every day around 5.00 pm. It is one of the most beautiful memories that you can take with you from the trip. Even if you are not so religious, you will enjoy the whole vibe of the place. It's rather fun and frolic with devotees singing their hearts out, spreading their love to God in every joyous way possible. Rishikesh houses two of the most popular bridges which are called Ram Jhula and Lakshman Jhula, respectively. The bridges are mounted on the top of the river Ganges. It's mostly crowded during the day but if you managed to go there early, you can click portfolio-worthy pictures. Take care of your belongings as there are monkeys lurking around to steal your things. It's better to be aware than get tricked by a monkey on your vacation. It's called "jhula", which in English means "swing" because if you stand still in the middle of these bridges, you will feel the motion. Every time a scooter passes by, you will notice how the bridge moves sideways.